In our large product line we are offering a wide gamut of Paver Chains. Our offered products caters to various industrial and commercial applications, owing to their study construction, high strength to bear immense load and dimensional accuracy. Our professionals manufacture this range using qualitative raw material and employing most feasible methodology. 80 mm conveyor chain for Paver finishers. Center distance between 2 parallel chains comes as 560 mm, 510 mm, 500 mm & 540 mm. If customer wants as per demand that also is possible with Tripcon. We also develop custom made chains as per customers requirement. We are providing a Quality product which will satisfy need of the Customer. Trouble Free Operations Guaranteed up to 1,00,000 Tones Laying. Chains are available quickly as most of the sizes are in regular production and Tripcon makes sure that customers get the delivery as per their requirement. we are manufacturing the product as per the customer’s specification and we also render the service of offering the special designs keeping in mind the operational requirements and the desired life. We are pioneers in offering a wide array of Paver Chain to our esteemed clients. Offered range is fabricated using high grade raw material under the astute supervision of our dexterous team of professionals. Customers can avail this range from us in various sizes, grades and other specifications as per their needs and requirements. We are manufacturer and supplier of Paver Machine Chain of all types. Our Paver Machine Chains are made of high quality material. We can customized as per the client requirements. We hold expertise in offering a wide range of Paver Chain for Wetmix Application, which is extensively used for road construction machinery. To manufacture this offered range, our professionals make use of only quality tested raw material, in adherence with the industry set quality norms. We provide these products in both standard and custom-design form with the aim to serve our esteemed clients as par their requirements. 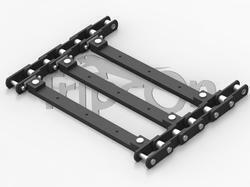 Tripcon manufactures good quality paver chains at very reasonable price. When asphalt is heated at a road construction site, the mix flows from dump trucks into the paving machine hopper. An asphalt paving machine uses a special scraper conveyor to transfer hot asphalt from the hopper to the road surface. The chains are used in double strand and they are connected to each other by using flight bars. These chains are used either as a single or double pair. The chains are installed within the delivery hopper of the machine. A multiplicity in chain types is encountered, but all are following the same general format. We are not worried of our competitors because we are focused on our customers. Contact our company for buying this quality product from us at market leading prices. 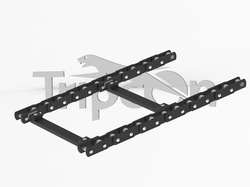 Tripcon manufactures Paver Chains for varied OEM’s over the Globe. Tripcon with a very wide selection of metallurgy in materials can serve customers with very unique design for a particular application. Links of Paver Chain are made from Carbon Steel and Alloy Steel as per the requirement of application/customer. Bushes and Pins are made from carburizing steel to achieve high resistance towards wear and for better longevity. Feeder Bars are made from carbon steel and heat treated for their durability. Looking for Paver Chains ?